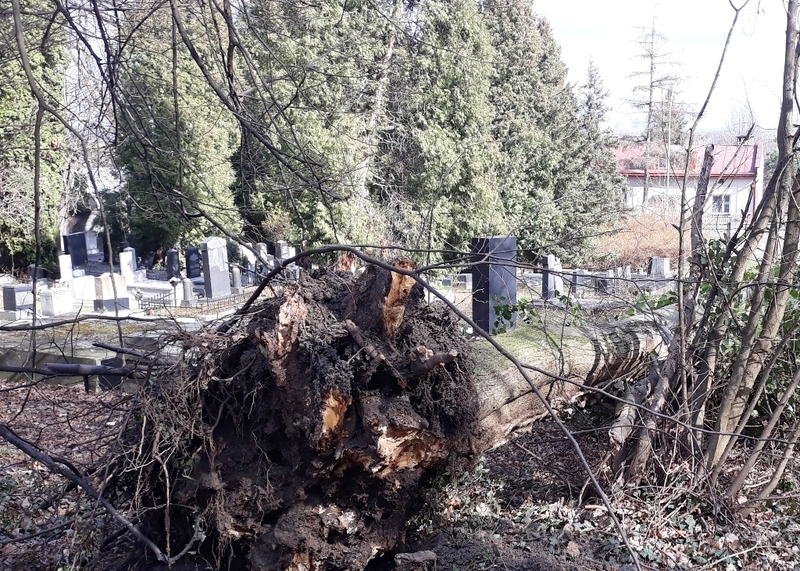 Weekend storms uprooted trees and left a huge mess at the Przemysl Jewish Cemetery. 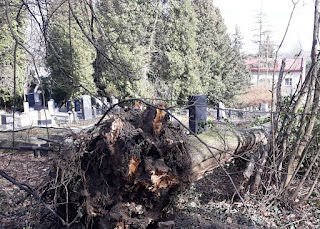 There are at least 10 large trees that need removal, one hanging precariously over a row of Matzavot. Remembrance and Reconciliation, Inc. will pay for the cutting, hauling, and cleanup but this will leave us short on funds for the summer and fall. If you'd like to help us out, go HERE. We are sad to report the passing of Dr. Thaddeus C. Radzilowski, longtime Remembrance and Reconciliation board member and supporter of our work in Przemysl. 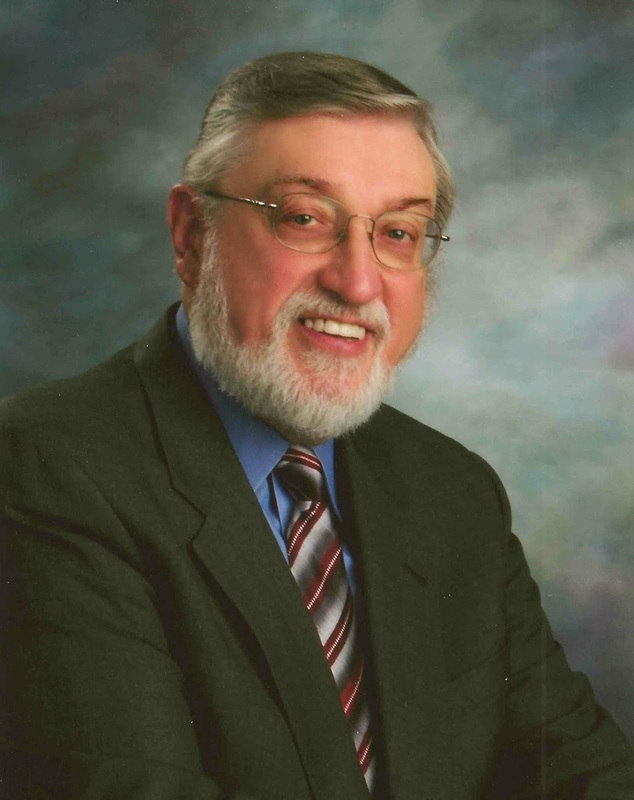 Today, Piast Institute, our Polish-American family, and our Hamtramck community lost a great leader in the passing of Dr. Thaddeus C. Radzilowski. Earlier today, July 20th, he passed away surrounded by loved ones. Dr. Radzilowski was a highly accomplished historian and academic studying Poland and Central and Eastern Europe, producing countless manuscripts on these important topics. Over the course of his rich academic career he has taught at University of Michigan, Madonna University, Heidelberg College, and Southwest Minnesota State University. He also served as the President of St. Mary College. Over the years, he not only educated thousands of American students about Polish and Central European history, he also mentored many of them and fostered countless community leaders. In 2003, Dr. Radzilowski co-founded the Piast Institute with Virginia Skrzyniarz. It quickly became the largest Polish-American think tank in the United States. As President of Piast, Dr. Radzilowski has focused the organization as a major research center, one of U.S. Census Information Centers, and as a representative of Poland and Polish-Americans in the United States, with worldwide network of accomplished fellows. Under his leadership, the Institute produced position papers, school curricula, research reports, conducted surveys, organized conferences and exhibits, and was very involved in the life of American Polonia. He also cultivated many relationships with Polish universities and institutions. Over the years, Dr. Radzilowski received many awards for his academic work, community involvement, and leadership. He was a corresponding member of the Polish Academy of Sciences (PAN). He served as an advisor and consultant to the U.S. Commission on Civil Rights and the U.S. Bureau of the Census and was a member of the Ford Foundation Commission on Ethnicity on American Life. In 1999, the President of Poland presented Dr. Radzilowski with the Cavaliers Cross of the Polish Order of Merit for distinguished contributions to the dissemination of Polish culture in the world. In addition to his contributions to preserving Polish heritage in the U.S., Dr. Radzilowski was an American patriot, a veteran of the U.S. Armed Forces who served his country in Vietnam. Those who knew Dr. Radzilowski well will miss him for his charm, his sense of humor, his countless stories, his sharp mind, and his infectious cheerfulness. Dr. Radzilowski is survived by his wife, Kathleen, three sons, John, Paul and Stefan, grandchildren Radek and Diana, sisters Fran and Cynthia, and brothers, Norbert and Fred. Details on a celebration of Dr. Thaddeus Radzilowski’s life will be announced shortly. Please direct any questions to the Executive Vice President of the Piast Institute Virginia Skrzyniarz, Skrzyniarz@piastinstitute.org or (313) 733-4535. 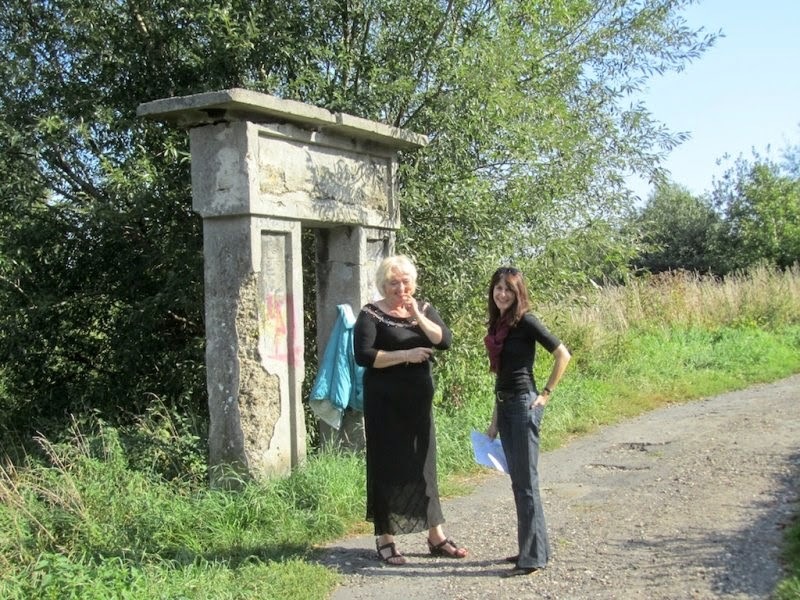 Finally... a website to search Przemyśl's Jewish Cemetery! Photos, GPS locations, translations, and more! 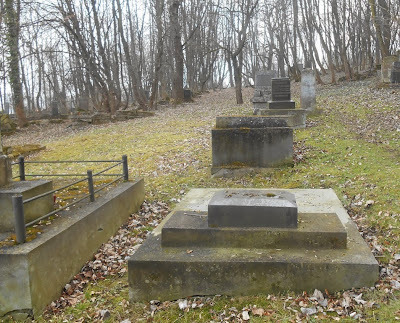 On behalf of Remembrance and Reconciliation, Inc., and using data sets from Andrew Kier Wise, Professor of History, Daemen College, and his students, as well as from Jacek Szwic, Piotr Szwic, Yale Reisner, and Lukasz Biedka, I've created a site where you can search the cemetery. Please report all bugs, errors, or suggestions back to me! Please donate to maintain the cemetery! Up to $3,000 of donations made through August 31, 2016 will be matched by an anonymous donor! 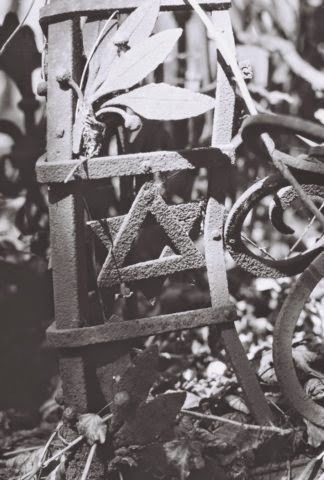 Below is from the flyer announcing the rededication of the memorial monument dedicated to the Jews of Przemysl murdered by the Nazis between 1942-3. It takes place June 17, 2016 at 11:00 in the square behind the building of the Specjalny Ośrodek Szkolno-Wychowawczy no. 1,Kopernika 14 Street, Przemysl. 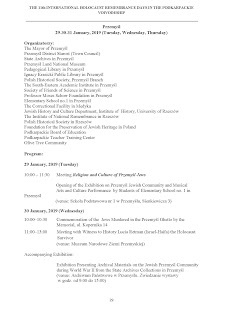 The initiator and founder of the works is Janusz Galiczyński of Przemysl.The honorary patronage over the ceremony was taken by the Department of Culture and History of Jews of the Institute of History of Rzeszów University. The history of the place. The place to commemorate in Kopernika Street in Przemyśl is connected with the tragedy of the Przemyśl Jews murdered in the years 1942 1943 - mostly in September 1943, during the liquidation of the ghetto. At this location the Germans killed at least 1,580 Jews. The victims of murder undressed in a nearby building of the Judenrat, then walked to the back of the prison, and there they were killed at the wall. The Germans burned the corpses on the spot and threw the ashes into the San. 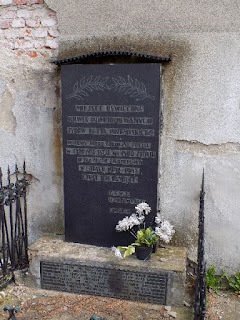 In 1956, under the Death Wall a small monument was erected with a plaque situated informing about the murder of 1580 Jews from the Przemysl ghetto by the "Nazi thugs". In March 1989 an eyewitness of the tragic events - Julek Wachs attached to the monument another small plaque informing about the murder of the Jewish children, women and men in summer 1943. 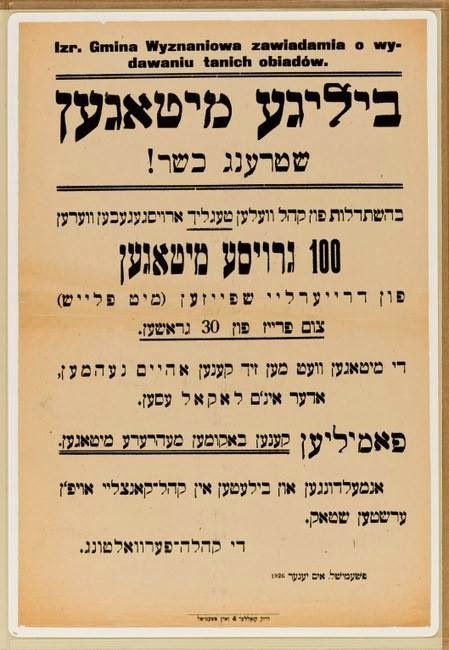 In the vicinity of the place the corpses of the victims were burned and the following were forced to do it: prof. Silber, Cuba Rosenzweig, Benjamin Wider, Wolfing. The fifth name he did not remember. For many years this place has become neglected. The tourists visiting it faced the ugly sight of the ruined monument. The initiative for restoration was put forward by Janusz Galiczyński a Przemysl social activist. After celebrating VIII International Holocaust Remembrance Day in Podkarpackie in January 2016, with his own effort and funds, he led to the restoration of the monument, its environment and the wall adjacent to it, under which the Jews were murdered. The construction work were done by the inmates from the prison in Przemysl. Mr. Galiczyński throughout the whole period of restoration was supported by Norbert Ziętal the manager of the Przemysl branch of Nowiny. Janusz Galiczyński is not a wealthy man. Asked why he did it? He responds - out of respect for these people. Out of respect for the murdered Jewish residents of Przemyśl, who once lived in this town and were an integral part thereof. In his act he sees a moral obligation to respect other people and to honor the for the murdered people at this place, because every death should be respected - especially such a tragic death. For much of the past decade, the Foundation has lead the effort to restore and maintain the Slowackiego Jewish Cemetery in Przemysl. 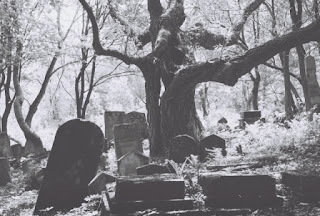 We have spent nearly one hundred thousand dollars to transform a forgotten, deteriorating field into one of the best Jewish cemetery sites in all of Poland. The work was initially focused on security and reclamation -- completing the surrounding fence and clearing half a century of overgrowth. The next phase saw us restoring the many deteriorating stones and markers, including the re-dedication of the Shoah mass grave monument. We've come a long way, but there is still much work to be done. It costs nearly ten thousand dollars per year just to maintain the site, funds that today come 100% from donors to Remembrance and Reconciliation. Marcin, a tourist guide from Przemyśl, sent me these photos of the new plaques on what remains of the old Jewish cemetery in Przemysl. What does the Hebrew say? And can anyone tell me who paid for this? 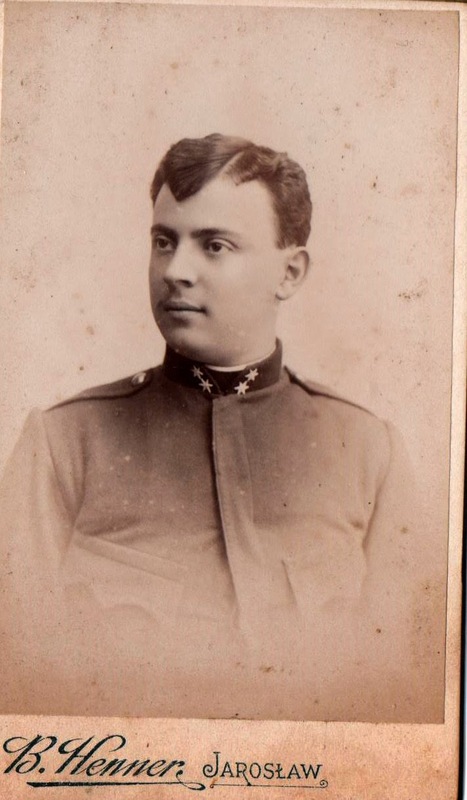 My grandfather was Eliasz Herzfeld, born in Przemysl on October 5th, 1919. He was in the Przemysl ghetto until the very end of its existence and was then deported to Stalowa Wola labour camp in 1943. He escaped miraculously and hid until the end of the war. All his relatives who were in Przemysl at the time of WWII perished in the Holocaust, either in the gas chambers of Belzec or in the Przemysl ghetto, a question mark that remains unanswered to us. - Markus Herzfeld, born on August 12th, 1906.
to Belgium before WWII and hid during the war. He passed away in 2013 at the age of 102. - Moische Herzfeld, born on January 16th, 1913. 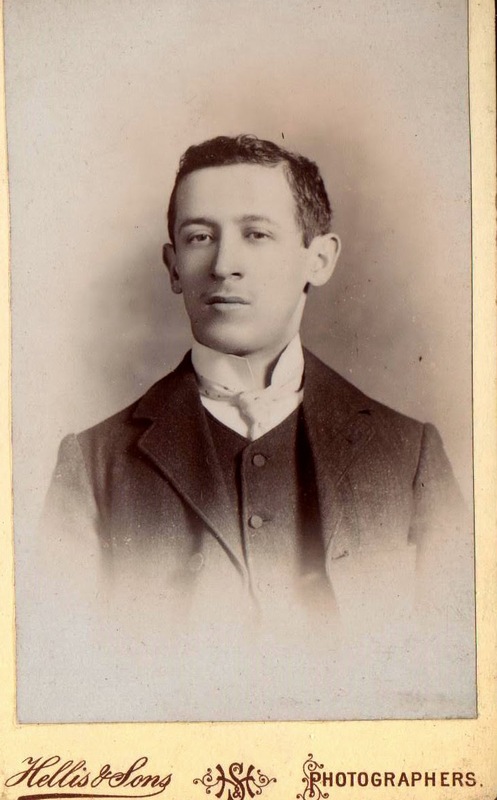 His parents were Salomon Herzfeld, of whom we unfortunately don’t know much (no picture, no place & date of birth) and Dwojra Tanenbaum, born on August 5th, 1878 in Przemysl. The Herzfeld family in Przemysl c.1921- left to right: Aron ; Moische ; the mother Dwojra ; Eliasz; Malvina and Markus . 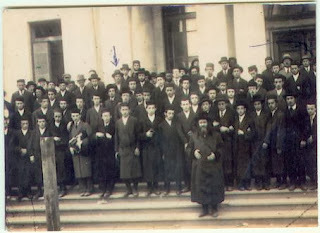 Absent from the picture are Izak and the father Salomon. Aron and Eliasz were the only members of the family to survive the Holocaust. 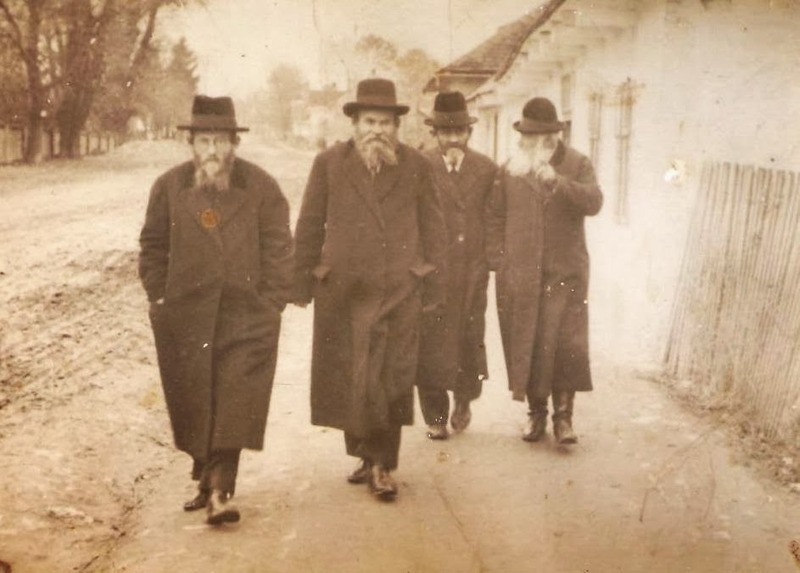 In Przemyśl, a private investor has purchased a house in which 13 Jews found shelter during World War II. He wants to preserve this place for future generations. The place in question is the old tenement house at 3 Tatarska Street. 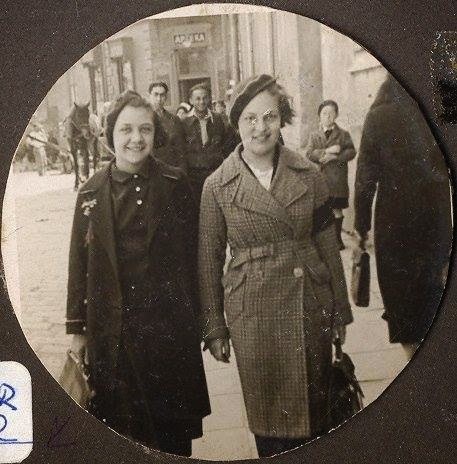 Since 1942 up to the liberation, two orphan girls – 16 years old Stefania Podgórska and her 9 years old sister Helena – had provided an asylum to the Diamant family of 13 people. They all survived the war. 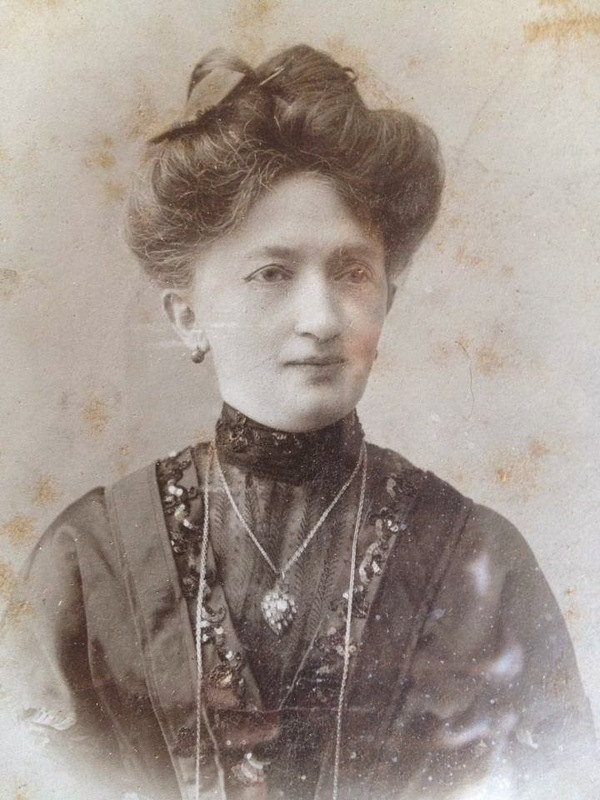 After the war, Stefania Podgórska married one of the rescued Jews – Maksymilian Diamant. 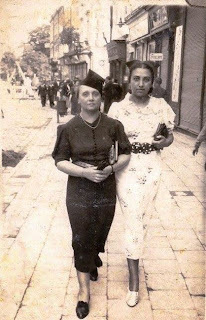 In 1979, both women were awarded the title of the Righteous Among the Nations. In 1996, this extraordinary story became a base of the film “Hidden in Silence” directed by Richard A.Colla. Three years ago, the deserted and neglected building at 3 Tatarska Street was put up for sale. Social workers and politicians came forward with various ideas concerning its future. 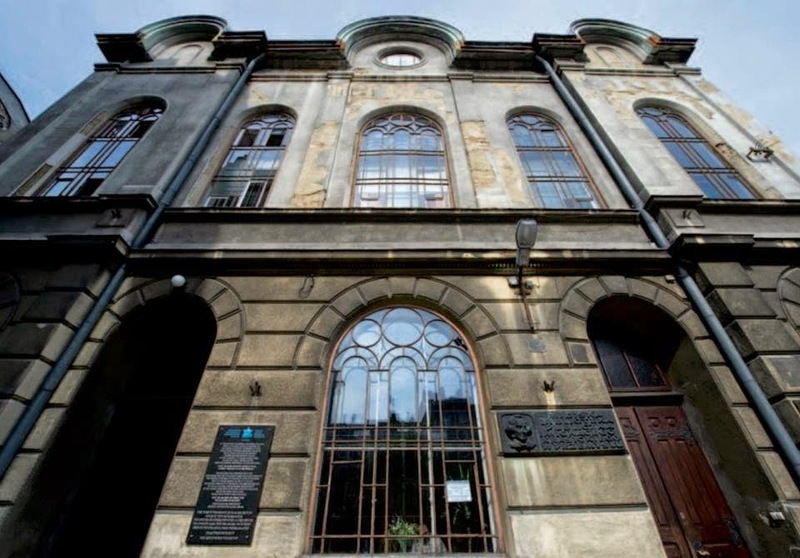 There were suggestions, for instance, to make the building over to the Foundation of Jewish Heritage in return for giving up a part of claims concerning the restitution of property of the former Jewish community in Przemysl. In April, the house was purchased by Maciej Piórkowski, owner of a private enterprise “Orion” dealing with renovation of monuments of history. The house is in a poor technical condition. Now, the new owner faces a difficult challenge of renovating it. 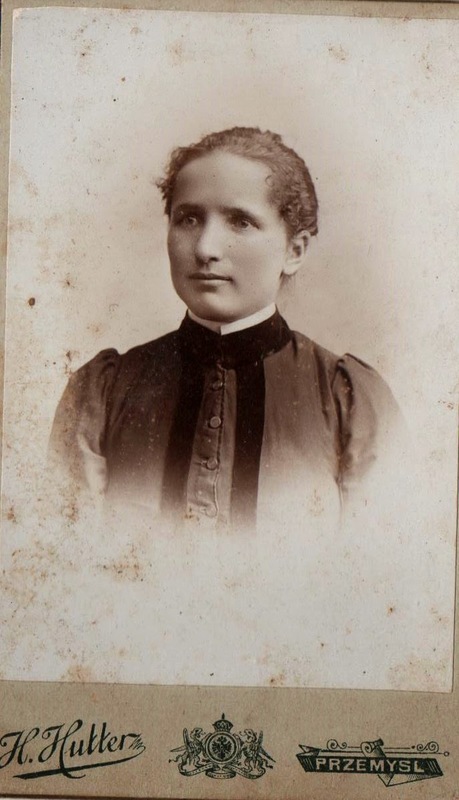 I've just learned about Przemysl-born Helene Deutsch in an email from a Polish journalist living in Vienna. Born Helene Rosenbach in 1884, she lead an extraordinary life. 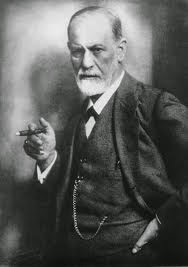 After a brief affair with Polish socialist leader Herman Lieberman, she traveled to Vienna and joined Sigmund Freud's infamous Wednesday night meetings of the Vienna Psychoanalytic Society, first becoming his assistant and later, colleague. She moved to Boston in 1936 and died in 1982 leaving behind pioneering work in woman's psychoanalysis and psychology. I'm a Polish journalist living in Vienna. I have a very close relation to Przemysl, the hometown of my mother and my summer stays during my childhood (not so remote, whatsoever!). I wanted to draw your attention to a fascinating biography of Helen Deutsch. Born in Przemysl, she was Sigmund Freud's long time assistant and later successful authoress and psychoanalytic in the US. 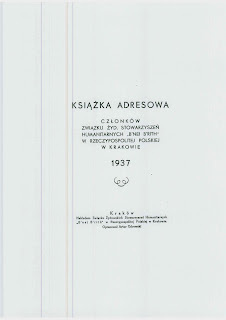 Her autobiography "Confrontations with Myself", containing a description of her childhood environment was published originally in 1973, got translated to Polish only in 2008. 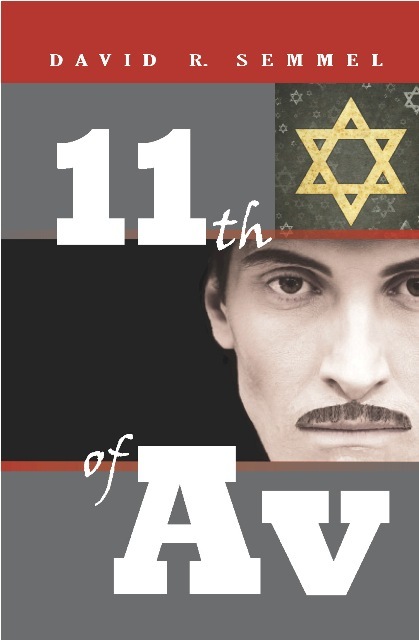 This book was greeted with much interests and brought anew attention to Przemysl's Jewish past. 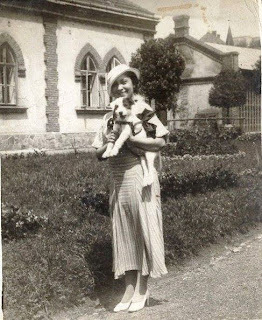 This is also when I realized that the house Helene Deutsch would grew up in (described in her memoir) , was the same house that the family of my mother lived! 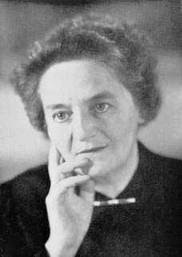 Also in Vienna the biography of Helene Deutsch is again brought to light. In 2000 a city park was named after her. In 2008 in the in the campus yard of the main university of Vienna, an artistic intervention took place. Its aim was to change the male-dominated image of this institution. The plates with the names of female scientists were put on the 154 busts of their (male) famous colleagues, a.o. 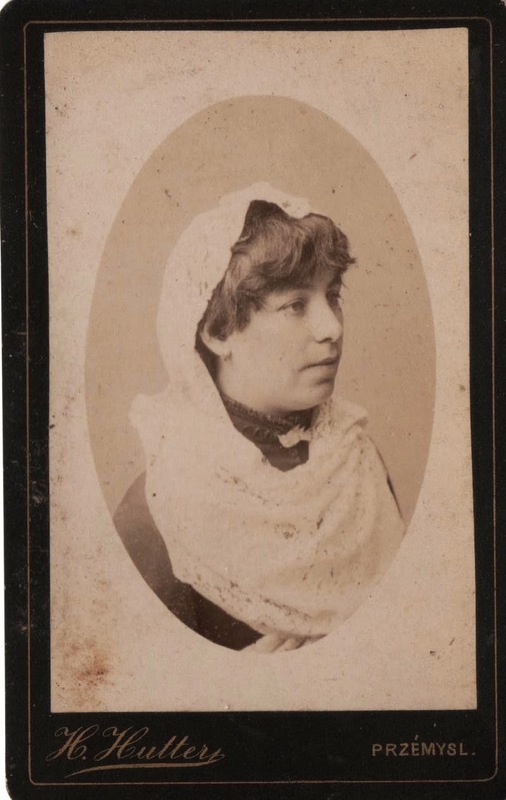 Helene Deutsch was remembered. For some time I've tried to document Deutsch's biography and those latest signs of commemoration, ie running the blog: rynek26.blogspot.com. I had the privilege to get in touch with Dr. Sanford Gifford (1918-2013), who was one of the closest friends and colleagues of the Deutsch family, after they moved to the USA. I also know about an extensive collection of private documents which is stored at Harvard University. 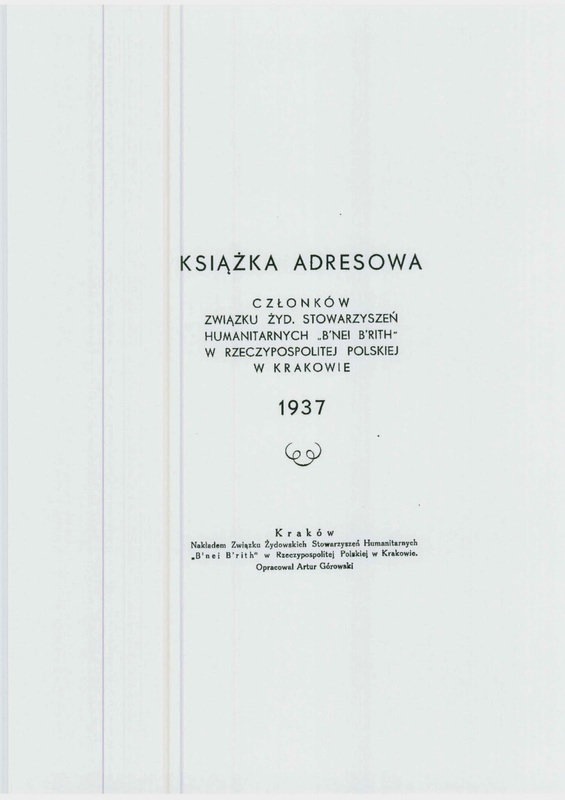 It contains Deutsch's notes and research on Przemysl. Attached to this email I'm sending you some excerpts that I could receive - should you once be interested in exploring this archive, I'd love to help you! There are many other biographies linked to Przemysl (and Vienna as well), a.o. Karl Duldig or Franz Marek , but anyway, I'm keeping my finger crossed for your very valuable work! 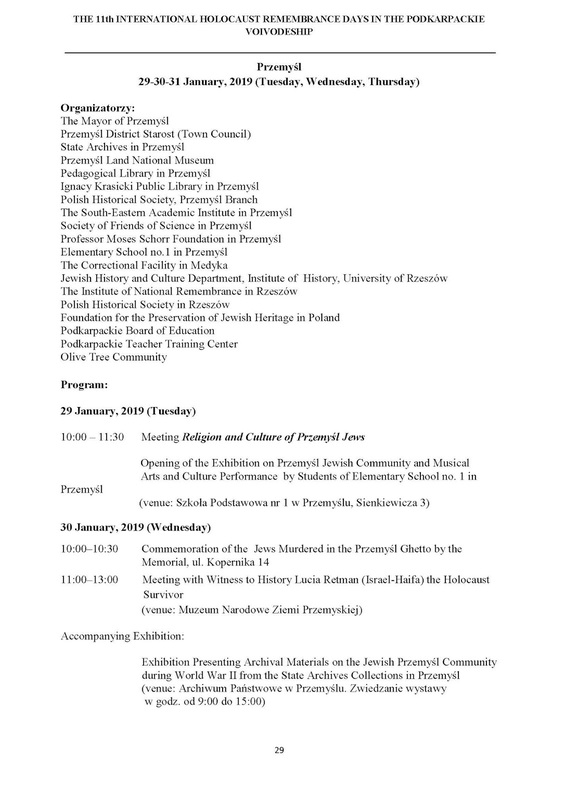 I hope there is not only the past, but also the future for the Jewish life in Przemysl! 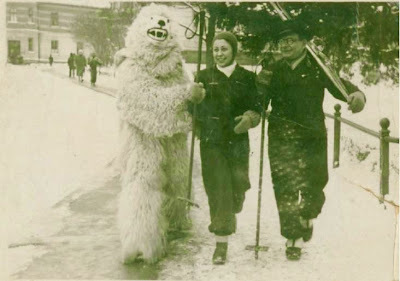 Skiing Przemysl's Tatar hill with the Yeti? 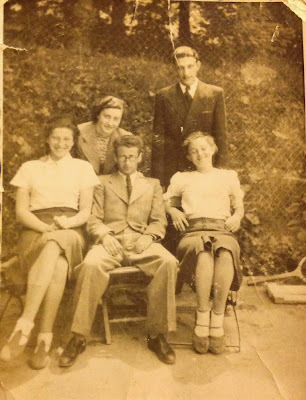 Some pre-war photos of my grandmother's parents and sisters, the city is Przemysl in Poland and it's about 1937. 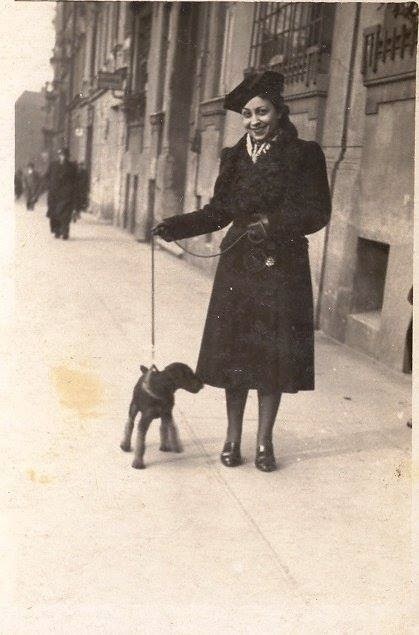 My grandmother loved dogs and she worked as a pharmacist all her life. Except my grandmother who escaped to Leninbad during the war they were all murdered by 1942. 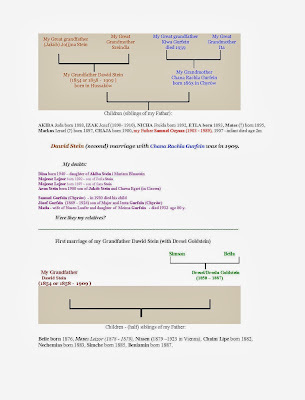 I'm always looking for information about Bethauer, Dawid and Kudesch families from Przemysl and L'vov. The happy dogs of Przemysl! 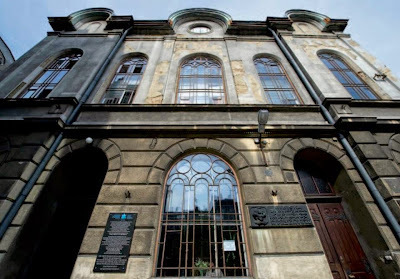 In an article she wrote for Jewish Heritage Europe last month, blog-friend Marla alerts us to some potentially troubling news about roof leaks at Przemysl's Scheinbach Synagogue. Built between 1910 and 1918, the synagogue was used as a stable by the Nazis, then a textile warehouse after WW2. Since the late 1960s it has housed the city’s public Library: the Library recently moved out to new premises. The building was restituted back to Jewish ownership (via the Foundation for the Preservation of Jewish Heritage, or FODŻ) in 2006; the city of Przemyśl has been paying rent on the building, and under the terms of its lease its obligations to pay rent and perform routine maintenance continue through 2016. 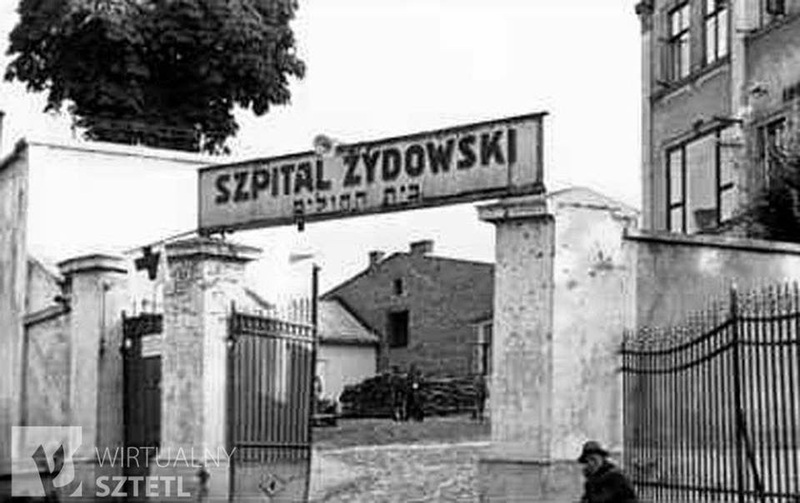 Blog-friend Marla found this wonderful Pre-War photo of the entrance to the Przemyal Jewish Hospital on ul. Słowackiego Street. Across the street was the old Jewish cemetery, today a vacant lot. 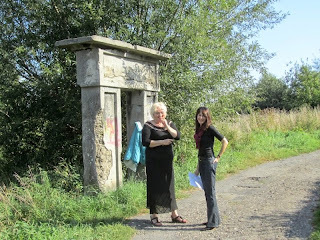 Across the road Domicela and Marla stand at the site of the 'old' Jewish cemetery; the entrance gate is all that remains. 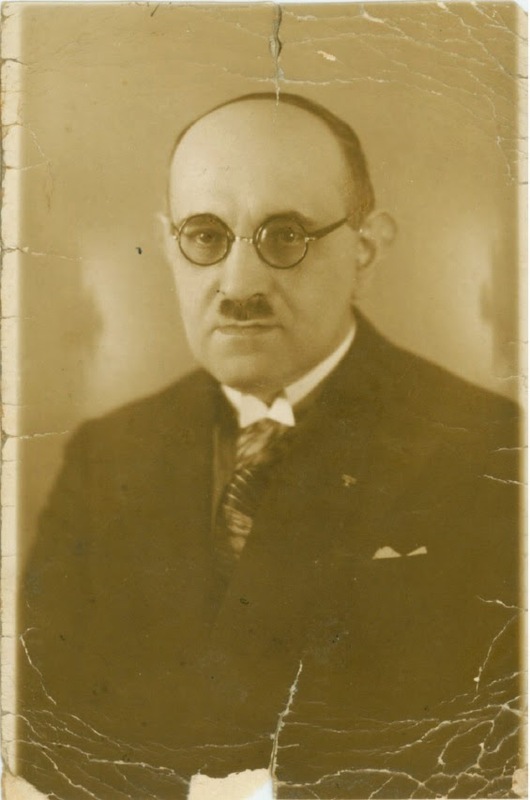 Longtime blog-friend Michal recently discovered that her great-grandfather, Dr. Oswald Bethauer, was the president of B'nai B'rith in the Przemysl area in 1937. 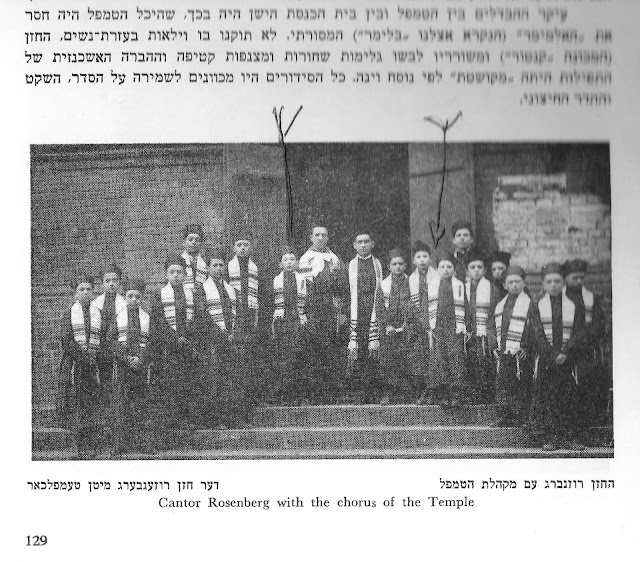 I have attached two files: one is the book of all the Bnei Brith organizations in Poland in 1937 including Przemysl, and the other is a picture of my GGF with a pin of the symbol of Bnei Brith on the jacket. 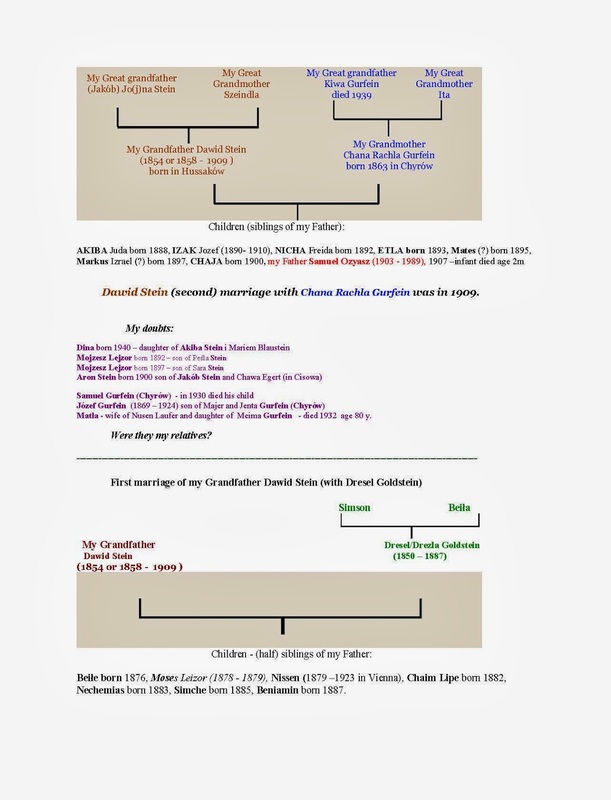 I am trying to trace ancestors with very little real hard info but I might get lucky! 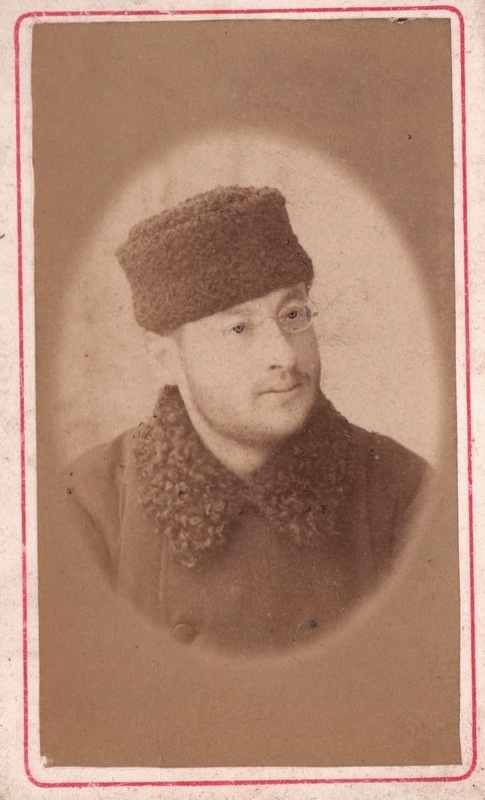 Based on a bunch of photographs taken in Przemysl around 1875 (also some in Lviv) and a little census info, I am looking for Solomon Silverman b1827 with daughter Esther b1855 Have you any info on these please? William sent me a trove of post cards. His great grandfather is to the left. 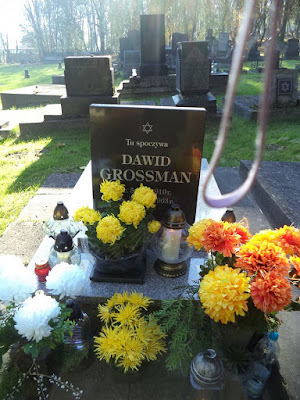 He is not sure who many of the people below are, other than that they seem to be related to the Silvermans of Przemysl. 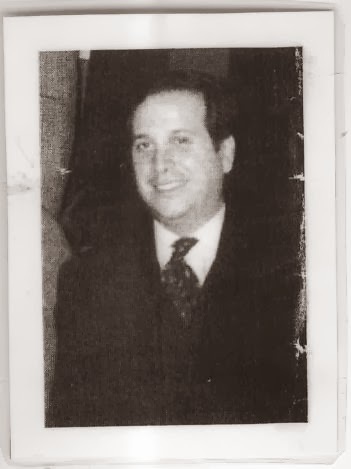 My grandfather was Emanuel Silberman. I don't think we are closely related. Thanks to the ever-energetic Marla, Remembrance and Reconciliation Foundation, Inc. is now on Facebook. LIKE it here! In addition to updating on R&R's ongoing work of maintaining and restoring the Przemysl Jewish Cemetery, our Facebook page is the place for announcements of exciting new initiatives, like our current proposal to convert the former Scheinbach Synagogue building in Przemyśl into a Galician Cultural Center which would be used for historical, artistic, cultural, and religious purposes. This is an update to an earlier post on Jeff:. Does anyone know the answer to his three questions, below? 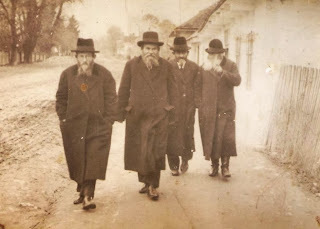 The photo below was taken in the Przemysl cemetery in 1949. 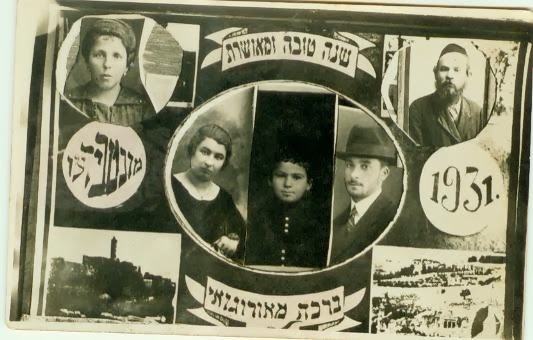 It shows the matzevot of my great grandmother, Rachela Nadel (died 1944), and my her nephew, Tzwi Leizer Rosiner (died 1943 and interred in Jewish cemetery in 1949). 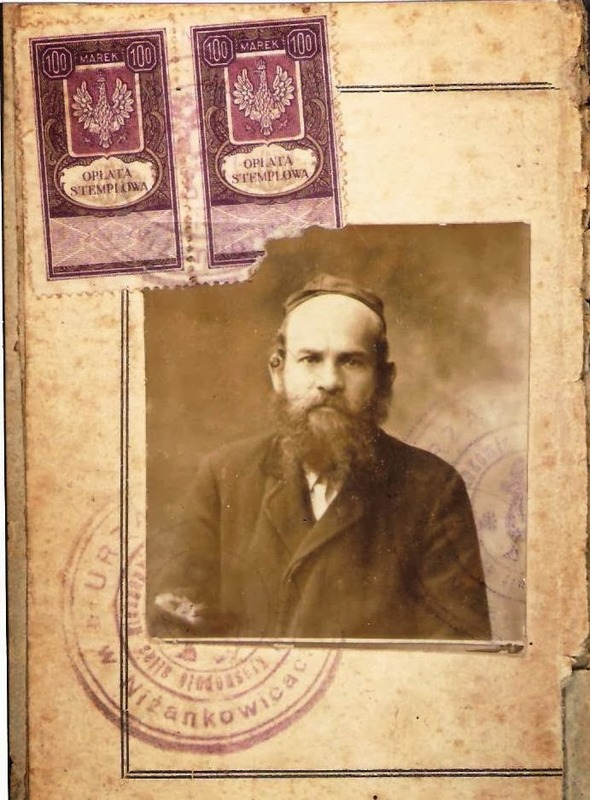 Last week I sent someone to the cemetery and he located the matzevah of Tzwi Leizer Rosiner. 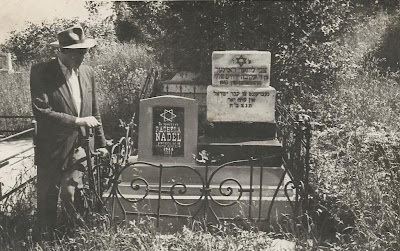 It is clear from the photos attached to this email that the matzevah had been toppled off of its original location and when the cemetery was renovated the matzevah was accidentally placed on the foundation of another grave, just off to the left-hand side. In other words, the Rosiner matzevah is now on the grave of another person. Please see the photos attached. You can see from the 1949 photo the metal enclosure/fence of the other grave which is still present today. Unfortunately, my great grandmother's matzevah is no longer there. 1. 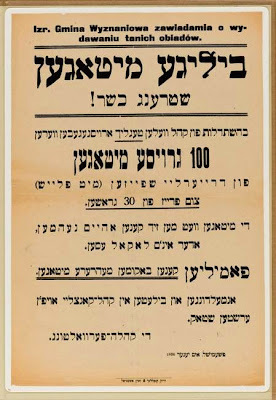 Do we need to contact anyone to obtain permission to remove the Rosiner matzevah from its current location and place it back where it should be? 2. Do we need to contact anyone to obtain permission to place a new matzevah up where my great grandmother's matzevah used to be? 3. Can you recommend anyone in Poland who I can hire to create new matzevah with hebrew letters and move the Rosiner matzevah? I am a daughter of Stefan Stein, a Holocaust survivor born in Przemyśl (Poland). 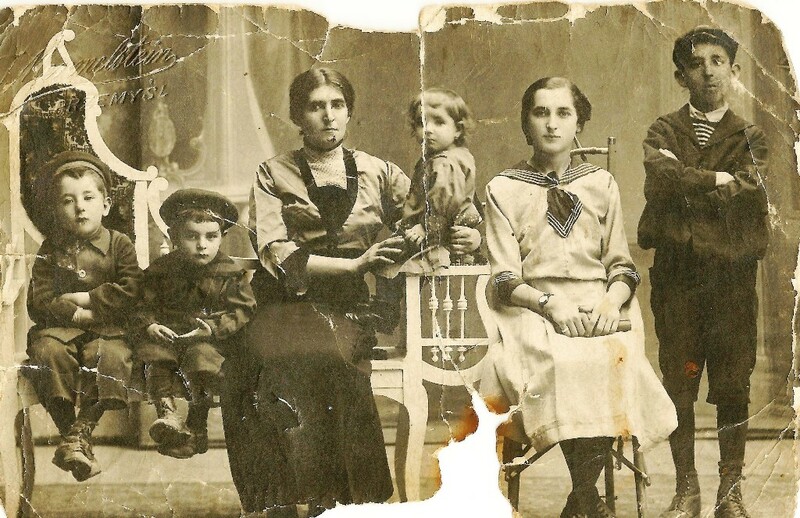 My father’s mother, four brothers and a sister were killed in Holocaust; my father survived the war at Horodenka, in my mother’s family home. 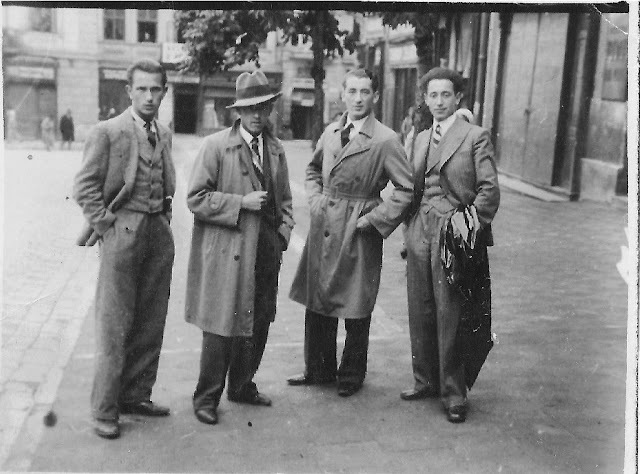 I am trying to get some knowledge about the life of my family killed in Holocaust, because I don’t want that they fall into oblivion. Also, I have a dream to find a trace of a member of the family who survived the Holocaust, and whose children or grandchildren are alive. I have never known any family from the side of my father; even one photo have not remained. The only traces after those people are the documents, which luckily remained untouched in the Office of Przemyśl and in the Archive of Przemyśl. Thanks to them, I could construct my little family tree, but still I have no trace of any living family member and I didn’t find any photo. 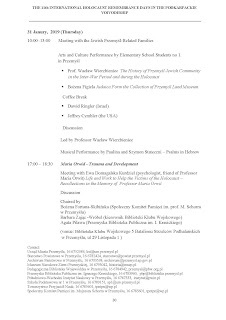 I live in Poland (in Łódź), I am a retired teacher of mathematics. I have no family except my sister Irena. 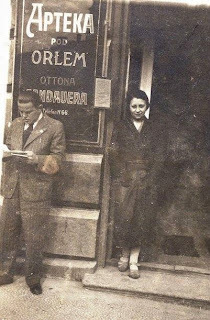 I would like to join some research group to work together; we could exchange sources of information about Przemyśl, perhaps find some photos. I know a little Yiddish and Hebrew. Ms. Marla Raucher Osborn, whom I met in the Facebook, in the “Polish-Jewish matters” group and in the Polish “Drugie pokolenie” (Second Generation)group, advised me to contact you. 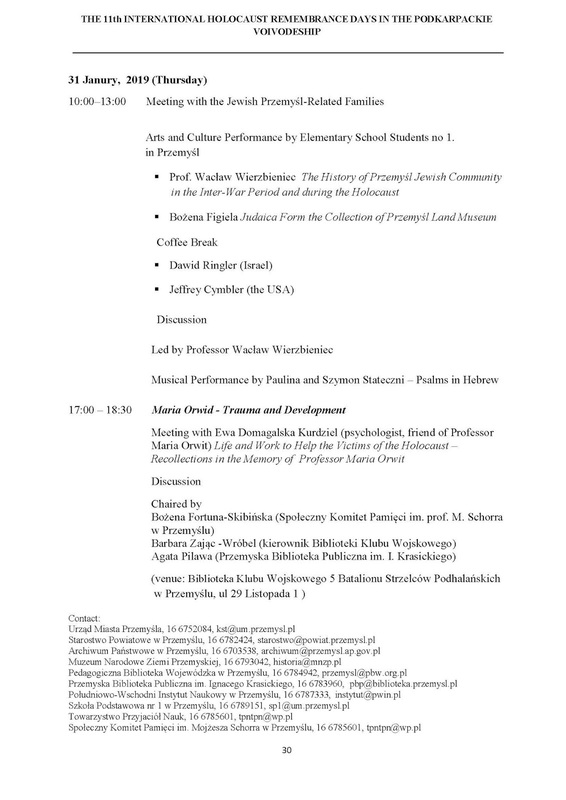 I would be very happy if you could help me to join a group working on Przemyśl. As you don't know me, I am sending, in the attachment, the copy of my father’s (Dawid Stein) birth certificate from Przemyśl. I am attaching three photos which were taken in the new Przemysl cemetery in 1945 or 1946. I have seen some videos on youtube of the cemetery but have not noted the memorial stones that are the first two photos of this attachment. I thought that you might be interested in them for historical reasons. More importantly, I am very interested in locating the two matzevot on the third photo which have a fence around them. The grave of Ruchla Nadel (left) is that of my great grandmother. She died on the day that she was liberated by the Russians. I was in the cemetery two times but was not able to locate these stones. The Rosiner grave on the right is that of Ruchla Nadel's nephew. 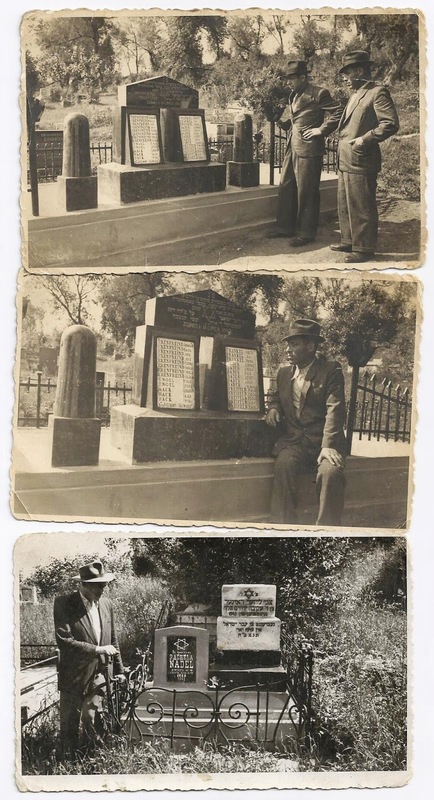 I only recently obtained these photos and did not have them when I visited the cemetery. I assume that the Nadel plaque has been vandalized. However, with this photo, I am hoping that I may be able to locate the foundation of the graves and then have new ones erected. 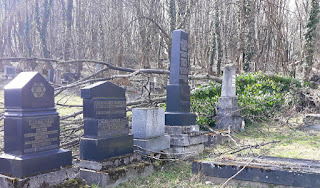 By any chance do you have photos of all of the matzevot in the cemetery including those that are destroyed? Do you know someone in Przemysl that I can hire to survey the cemetery with the photo and try to locate the graves. This is a project we really need to get going on. The cemetery is huge and only a small portion of it is well preserved. Knowing what is where is the first step to uncovering all that is there. Dr. Pablo Santiago Hübner Varela, from Montevideo, Uruguay, is searching for information on his father Professor Mario Hübner Lehrer (1925-2008) who was born in Nizankowice, south east of Przemyśl just over the present-day Ukrainian border. 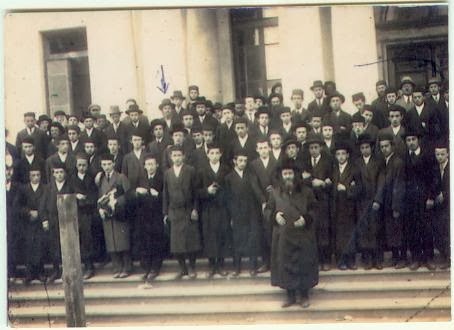 He was descended from a long line of rabbis and scholars and after immigrating to Uruguay with is parents he went to university became a noted scientist. Pictured below, he converted to Catholicism in 1950. 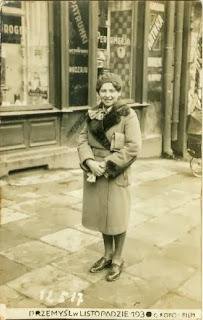 My father was Jew, my mother Spaniard. 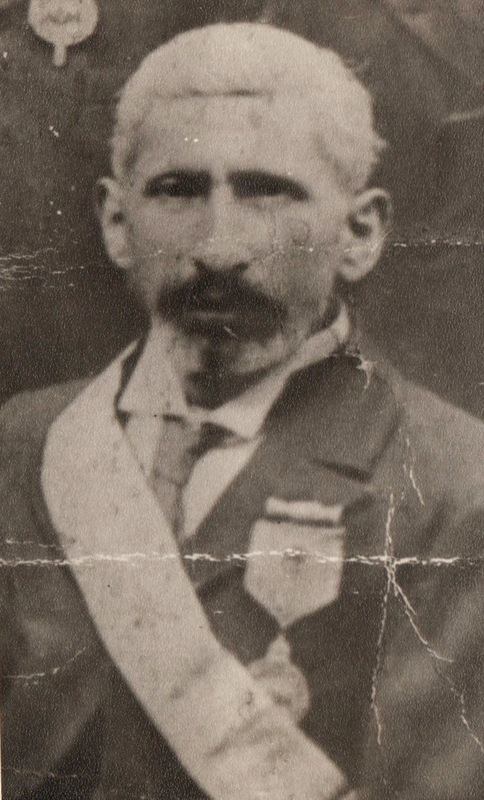 He born zadik Kohen, family of Rabbis, chief of Jewish communities, Town Hall Council etc. For me is important all about Lehrer Family, Hübner family, Nizankowice, Nyzhankovychi specially where born my father. Also Dobromyl an Bircza where HÜbner comes from and Lwow,Lviv, Lemberg. Also Lublin and Krakow. 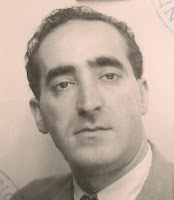 My father Mario, Majer, besides him Naftali Hübner his father, Chaja Hinda or Hela Lehrer Ganz, Hübner by marriage and the eldest people, Abram Jakob Lehrer and his wife Leah Ganz (really Lehrer by marriage and birth.